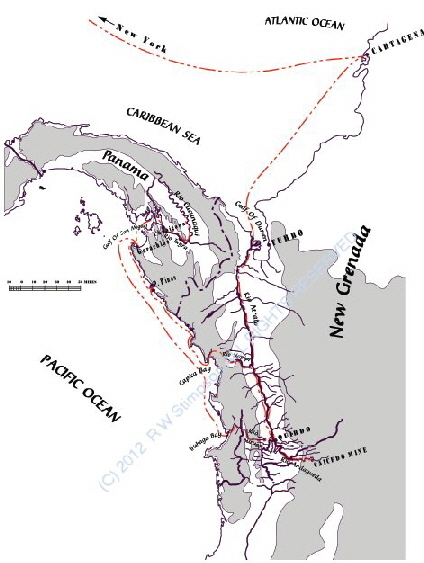 In the early 1850’s little was known about the region of South America around Panama and New Grenada (now called Columbia), and many explorers ventured south into the hostile jungle regions south of Panama long before the canal was sited there, seeking the best possible route to take - preferably without needing locks. In June 1850 Kennish started his first exploration of the area for the Hope Association of New York, where he initially located and purchased for them the Caicedo Gold mine south of the city of Quibdo on a tributary of the Rio Atrato. During the same expedition he canoed over 200 miles along the Pacific coastline. The map here shows the route of Kennish’s first expedition and is taken from the book.